Finest OST to PST Converter – A Free Download and Full Version with Several Licenses to Suit Your Particular Needs! If you are looking for the finest OST to PST converter that converts the data between files without errors, stop looking any further. USL Software developed “OST Extractor Pro” is exactly that, and more. It was developed by keeping all the challenges and complexities of email file conversion in mind. The tool will convert all items thoroughly, offers multiple options for control and flexibility, and features an intuitive interface that makes the job easier even for beginners. The powerful algorithms make it perfect for IT professionals to perform large-scale OST to PST migration. There are many things that can break havoc in your experience, and worst of all is data loss. Most ordinary OST to PST converters available for free download are poor in their conversion algorithms. They cannot reach deep and wide into the OST files and thus fail to detect many components. And most of them are important for you make sense of your data – like date and time, Bcc, Subject line, and other important metadata. And that too is the best you are going to get from free downloads of OST to PST converters. Most of them don’t even go through actual conversion properly, leaving the entire data untouched. And if by any off chance, you do get a tool that has the algorithms to convert data without losing the integrity, they will be either hard to use due to their poorly developed interfaces, or will be too expensive (if available at all other than for large corporations), and dozens of other problems. That’s where “OST Extractor Pro” totally changes the picture. It’s an affordable tool, with a free trial version available and a full version available with several licenses to suit your specific needs. It has a perfectly built interface that allows you to convert data easily but without compromising with features, power, and flexibility. An expert with complex conversion can get the most out of it and a basic home user can also use it without efforts. This excellent combination of power and simplicity makes it the finest OST to PST converter tool right now. “OST Extractor Pro” works by direct extracting contents from OST files and converting them into PST format. Then you can simply go to “file” à “Import” in your Windows Outlook (or Mac version too) and get the data imported successfully. This is an extremely simple and straightforward method than any other solution out there. If you want to try out “OST Extractor Pro,” download the setup using the link below. Double-click on it and follow the instructions to install. It will take less than 2 minutes. Once installed, you can directly start using it without any activation or sign-up. It works by default in a free trial mode that converts ten items per folder. Get free Download at http://www.ostextractorpro.com/download-now/. The link to register for a paid license is given at the top of the application. Activate it after seeing how it works in action. Get Full Version at http://www.ostextractorpro.com/purchase-now/. You can also rely on the support staff of USL Software in case you need help, have any queries, or are stuck at any point during conversion. USL Software also releases updates that will always be free, and will make the tool even better. 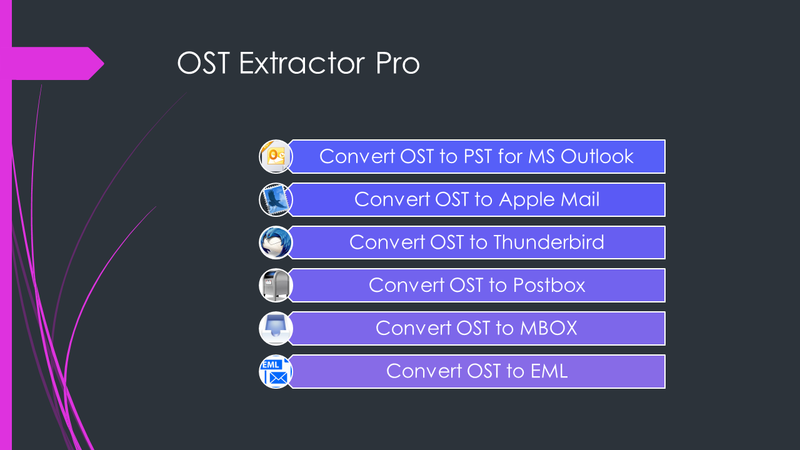 If your are looking for OST to PST Converter free download full version, visit the OST Extractor Pro website here: http://www.ostextractorpro.com/. Previous Conversion OST to PST – Quick, Accurate, and Simple!